Have you ever been talking with someone and had the feeling he would rather be elsewhere than with you, even though he seems to be enjoying your company? A photo of that scene would probably reveal two things: first, the person's head is turned towards you and facial signals such as smiling and nodding are evident; and second, the person's body and feet are pointing away from you, either towards another person or towards an exit. The direction in which a person points his body or feet is a signal of where he would prefer to be going. "Seriously? ... The client at the office is more compelling than what you have ... here, now?" In the above, the woman is trying to hold the man's attention by appealing to his baser instincts. The man, despite what the emotional side of mind wants to do, apparently has a work commitment SO compelling that he wants to continue in the direction his body is pointing. His loss! 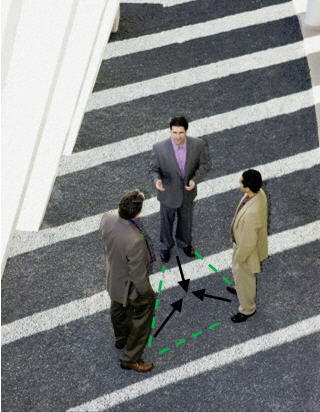 In any face-to-face meeting, when one person has decided to end the conversation or wants to leave, he or she will turn their body or feet to point towards the nearest exit. If this was a conversation involving you, it's a signal that you should do something to get the person involved and interested or else terminate the conversation on your terms, allowing you to maintain control. We stated earlier that the distance between people is related to their degree of interest or intimacy. The angle at which people orient their bodies also gives non-verbal clues to their attitudes and relationships. Most animals, if they want to fight with another animal, will signal this by approaching head on. If the other animal accepts the challenge, it will reciprocate by also standing head on. The same applies to humans. If, however, the animal wants to check out the other animal at close range but doesn't intend to attack it will approach side on, just as friendly dogs do. And so it is with humans. A speaker who takes a strong attitude to his listener while standing straight and facing them directly is perceived as aggressive. The speaker who delivers exactly the same message but points his body away from the listener is seen as confident and goal oriented but not as aggressive. To avoid being seen as aggressive, we stand with our bodies angled at 45 degrees to each other during friendly encounters to form an angle of 90 degrees. The picture above shows two men with their bodies angled towards an imaginary third point to form a triangle shape. The angle formed indicates that a non-aggressive conversation is taking place and the body language as expressed in their arms is also not competitive or defensive. The formation of the triangle invites a third person to join in the conversation. If a fourth person is accepted into the group, a square is formed and, for a fifth and sixth person, either a circle or two new triangles are formed. In confined spaces like crowded buses and underground trains, where it's not possible to turn your body away from strangers to a 45-degree angle, we turn our heads to the angle instead. When two people want intimacy, their body angle changes from 45 degrees to closer to 0 degrees, that is, they face each other more directly. A man or woman who wants to monopolize a person's attention uses this position, as well as other courtship gestures, when they make their play. A man will not only point his body towards a woman, he also closes the distance between them as he moves into her Intimate Zone. To accept his approach, she need only orient her body angle to 0 degrees and allow him to enter her space. The distance between two people standing in a Closed Position is usually less than in the open formation. In addition to courtship displays, both may mirror each other's gestures and increase eye contact if they are both interested. The Closed Position can also be used between people who are hostile towards each other in order to issue a challenge. Research has shown that men fear attack from the front and are more wary of a frontal approach, while women fear attack from behind and are wary of approaches from the rear. So never stand front-on with a male you have just met. He perceives it as aggression from a man and sexual interest from a woman. If you are male, it's acceptable to approach a woman from the front and eventually you can angle yourself to 45 degrees. 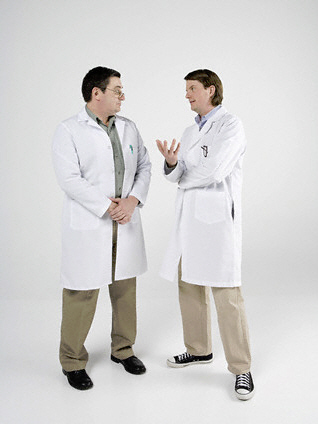 The next illustration shows the 45-degree Open Position taken by the first two people, which invites a third person to join in the conversation. If a third person wants to join two others who are standing in a Closed Position, he'll be invited only when the other two angle their bodies to form the triangle. If the third person is not accepted, the others will hold the Closed Position and turn only their heads towards him as a sign of recognition; and they will probably give tight-lipped smiles. Does the body positioning of two men in apparent discussion mean the third man is an unwanted interloper? A conversation between three people may begin in the open triangle position but eventually two people may take the Closed Position to exclude the third person. This group formation is a clear signal to the third person that he should leave the group to avoid embarrassment. Crossing the knees towards another person shows a sign of interest in or acceptance of that person. If the other person also becomes interested, he will cross knees towards the first person. As the two people become more involved with each other they begin to mirror each other's movements and gestures. In the picture above, the man and woman to the left have formed a closed position that excludes all others, such as the man on the right. The only way in which the man on the right could participate in the conversation would be to move a chair to a position in front of the couple and attempt to form a triangle, or take some other action to break their closed formation. But, for now, they'd like him to take a long walk off a short pier. Not only do the feet serve as pointers indicating the direction in which a person's mind is going, they also point at people who we find the most interesting or attractive. The guy's body positioning, foot pointing, and interpersonal distance distill this into a very simple story. The crossed arms and stare off into empty space could translate into she is playing hard to get, or ... that she truly has no interest in either of these gentleman. Few people ever consider the effect that body and foot pointing play in influencing the attitudes and the responses of others. If you want to make others feel comfortable use the 45-degree Open Position and, when you need to exert pressure, use the direct body point. The 45-degree position allows the other person to think and act independently, without feeling pressured. Avoid approaching men directly from the front or women from behind. These body pointing skills take a little practice to master but they can become natural before long. In your day-to-day encounters with others, foot pointing, body pointing and positive gesture clusters such as open arms, visible palms, leaning forward, head tilting and smiling can make it easy for others not only to enjoy your company, but to be influenced by your point of view.